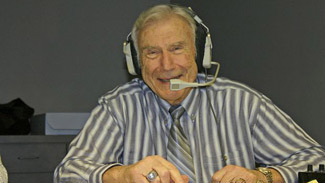 For the past six decades, Bob Chase-Wallenstein has been the radio play-by-play voice of the Fort Wayne Komets of the East Coast Hockey League for the 50,000-watt Indiana-based station, WOWO. He has inspired many young sports enthusiasts to pursue a career in hockey broadcasting, including Mike "Doc" Emrick. That's one reason he'll receive the Lester Patrick Trophy at the U.S. Hockey Hall of Fame induction ceremony on Monday. Not to be forgotten, however, is the memorable broadcast he presented on March 20, 1954, at the Indiana State High School basketball championship. The game involved tiny Milan High School against mighty Muncie Central, the prohibitive favorite seeking a fifth straight championship. The game and outcome was so memorable, it inspired the movie "Hoosiers". "Milan was a school of about 120 students and Monsey has 3,500," Chase told NHL.com. "Little did I know at the time, I would be a part of history calling that game." Actually, Chase recalls coming away unimpressed with the pace of the game until the later stages. "The game was terrible," Chase said. "When you tune into the state finals coming from Conseco Fieldhouse in Indianapolis, no matter what team wins it in the end, when they hoist the trophy, the ecstasy far exceeds the selfishness of tradition." Chase will never forget the hero of the game, Milan's Bobby Plump. "I remember Muncie was winning 28-26 and Bobby standing at center court and holding the basketball for almost four-and-a-half minutes," Chase said. "Nobody went out to get him. Try spending four-and-a-half minutes describing a basketball play-by-play with nothing happening. "I remember talking about my kids that night." According to published reports, the Milan coach admitted he was so unsure of his game plan at that point, he ordered Plump to hang on to the ball until he figured it out. Since there was no shot clock, it was perfectly legal. "I remember Milan had six players who could really play the game and two players capable of coming in in relief," he said. "The Milan players were very disciplined and great ball-handlers. They wouldn't give up the basketball and the game turned out to be a one-on-one contest between Plump and this little guard from Munsie, Jimmy Barnes." Chase vividly recalls Plump standing at the top of the key while trying to fake his opponent in both directions. "He'd watch Barnes' feet and the minute his feet went the wrong way, he drove the lane and laid it up," Chase said. "On the winning shot, Plum made one move outside, but Barnes thought he'd come back inside. Plump kept driving outside of the lane and put in the layup with two seconds left in the dramatic final moments." The Milan Indians, who scored a 32-30 victory, became the smallest school ever to win a single-class state basketball title in Indiana. The team finished their regular season 19-2 and sported a 28-2 overall record.